Scosche is bringing a little boom to 2015 with the boomBOTTLE + (plus). This speaker is fully water and dust proof with a sealed enclosure, and features up to 11 hours of battery life. It features twin 55m drivers and will pair with another boomBOTTLE + (plus) for L/R stereo sound. It’s also portable, and is designed to fit in a bicycle cage. 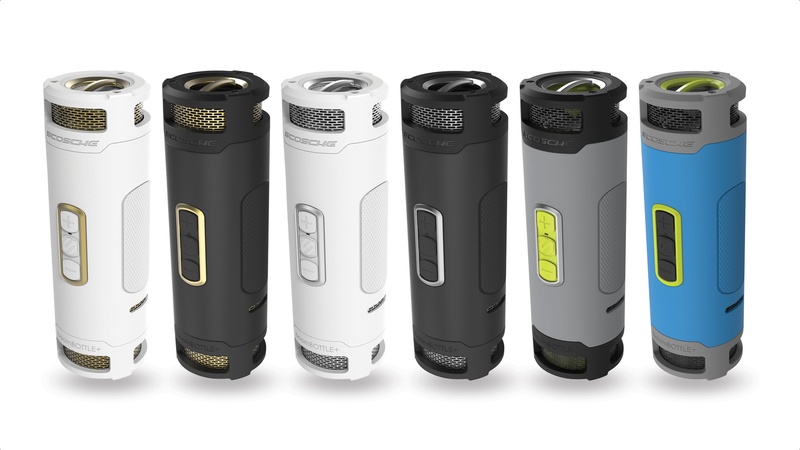 The Scosche boomBOTTLE + (plus) is $179.99 and will ship in Q2. It comes in multiple colors. LAS VEGAS  (Jan. 6, 2015)  Scosche, the creator of the Original boomBottle®, is pleased to introduce a new member to the boomBOTTLE family, the boomBOTTLE + (plus). boomBOTTLE + (plus) is a rugged, powerful, portable Bluetooth speaker ideal for streaming music while biking, hiking, camping and more. The weatherproof, two 55mm driver equipped speaker features an IP67 rating (water and dust proof), dual pairing that produces true stereo sound when two boomBOTTLE + speakers are used and up to 11 hours of streaming music ideal for any outdoor adventure. This unique speaker will be included in Scosches expanding Optimized for OUTDOORS® series of rugged products designed to withstand harsh outdoor environments. It features a durable shock absorbing TPU exterior, strong enough to withstand drops or vibrations caused from rough terrain, plus non-slip side finger grip areas. The boomBOTTLE + is constructed with sealed dustproof speaker grills to keep the dirt out during backcountry rides. It also fits conveniently into most bicycle bottle cages, so you can take it with you while on the trail. Equipped with larger dual 50mm drivers and two passive radiators, the boomBOTTLE + deliver rich, clear audio with amplified acoustics for even the loudest environments. The integrated omnidirectional diffuser channels music in all directions, creating 360 degrees of immersive sound. A large passive subwoofer housed in a tuned and ported enclosure delivers incredible bass. The boomBOTTLE + also delivers more power faster via its Perfect Charge circuitry. A top flap opens to reveal the protected USB charging and audio ports. Connecting your smartphone or other mobile device to the speaker via the USB charging port permits convenient, rapid device charging while you enjoy your music. A Bluetooth wireless range of 33 feet eliminates the need for unruly wires, and the large rubberized front buttons make it easy to skip tracks and adjust volume even when your smartphone or tablet is safely tucked away. The boomBOTTLE + will be available in black/gold, white/silver black/space gray, white/gold to perfectly match Apples new line of iOS products plus several sporty color combinations. The speaker will be available Q2 2015 for $179.99 MSRP. Follow Scosche at twitter.com/scosche or facebook.com/scosche for the latest news on all of the companys award-winning mobile accessories. Celebration its 35th year in business, Scosche Industries is an award-winning innovator of consumer technology and car audio installation hardware – committed to delivering quality, value and unmatched customer service. Scosche finds inspiration in the California lifestyle, culture, music and people. The designers and engineers at Scosche develop products that reflect a rich heritage in audio. These influences can be seen in the accessories and products that are now in the hands and vehicles of people stretched all across the globe. With over 95 patents and countless industry awards it is easy to see why Scosche is consistently at the forefront of technology and innovation. www.scosche.com.